Free Shipping Included! Source One Premium Metal Large Podiums In Black or Silver Modern Curved Design (Black) by Source one LLC at Momiji Studios. MPN: S1PodiumMetal. Hurry! Limited time offer. Offer valid only while supplies last. Our large metal podiums measure 18 inches wide x 48 inches tall X 24 inches wide. Substantial appearance & feel, artfully designed for any decor. Our large metal podiums measure 18 inches wide x 48 inches tall X 24 inches wide. Substantial appearance & feel, artfully designed for any decor. Well built & durable. 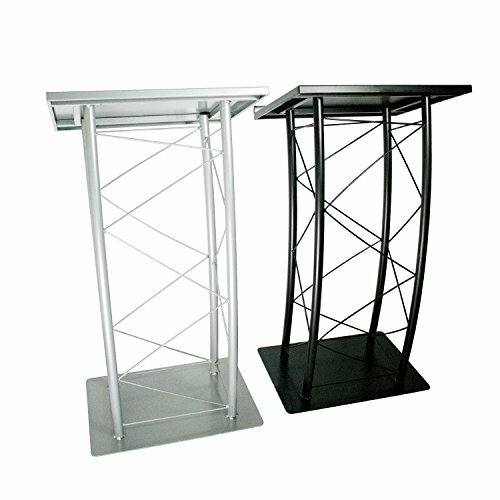 n your choice of color, these metal podiums bring an sophistication to any environment. There perfect for schools, churches and all presentations. They are easy to whip clean, and the large display space has optimal room for all presentation notes. SourceOne podiums ship to you already put together, simply remove it from the box and you're ready to go. The heavy-duty metal finish is easy to clean, you can simply wipe off the outside. Source One podiums are designed for continued use and enjoyment for years to come. VERSATILE. In your choice of color, these metal podiums bring an sophistication to any environment. There perfect for schools, churches and all presentations. They are easy to whip clean, and the large display space has optimal room for all presentation notes. EASY SET UP. SourceOne podiums ship to you already put together, simply remove it from the box and you're ready to go. The heavy-duty metal finish is easy to clean, you can simply wipe off the outside. Source One podiums are designed for continued use and enjoyment for years to come. If you have any questions about this product by Source one LLC, contact us by completing and submitting the form below. If you are looking for a specif part number, please include it with your message.